Home » Fashion » Clothes » Am I an XS or is it just vanity sizing? Am I an XS or is it just vanity sizing? I’m not thin but neither am I large. In the local Asian brand market, I usually take an M (Medium) size for clothes without being over ambitious. Yet going into to Western (American, British or European) clothes stores, I find I’m fitting into sizes like XS, S (MNG, Zara, Banana Republic) 0, 2 (Banana Republic, Gap) 8 (Marks & Spencer, TopShop or any British brand). The question is, am I really fitting into those tiny sizes? If I am, then how on earth are the even slimmer or smaller sized girls fitting into anything in these brands? This is the phenomenon of vanity sizing. I personally believe that vanity sizing exists. Why I say so is because when you compare men and women’s clothing sizes, you’d notice that most men’s sizes are constant across most brands. Men’s shirts are measured by collar size (which don’t differ by very much), chest and sleeve length and men’s pants are measured by waist and length of the leg. That’s mostly all there is to men’s wear I’ve found. Know a man’s collar and waist size and you can invariably shop for your man at any time, even with him absent, without too much fear of his clothes not fitting. Try with with women’s clothes and you have a nightmare on your hands. The same dimensions could mean anything from an XS to an M depending on the brand and cut. I personally feel it would be better if there could be some form of chart or guideline provided that shows you what the measurements of an XS or M are. Worse still when numbers come into play. Can you imagine if I’m a 0 in sizing, what would a smaller girl be? Negative? I have seen labels with negative sizing once (I can’t recall where) and it wasn’t pretty, I assure you! Negative sizing is just wrong! I think manufacturers are basically catering to the psychology and vanity of women. Weight and size are 2 things many women obsess about. Manufacturers can capitalize on this by reducing their label sizes while keeping the dimensions the same. 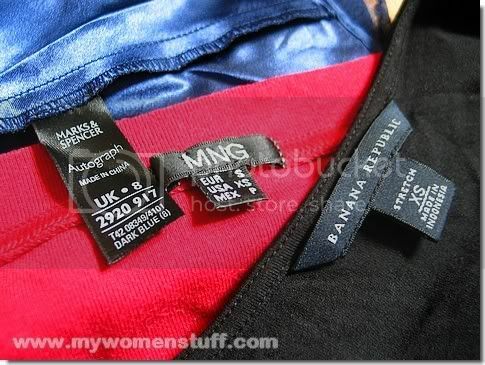 So, if you normally wear M but find that you are an S or XS in a certain brand, you might want to keep shopping there just so your wardrobe is populated with clothes that bear the label of a smaller size. I guess it might make some people happy but it doesn’t help or encourage them to lose any extra weight if they are still fitting into their old sizes albeit the dimensions might now be larger. I must admit to a little thrill every time I’m told I take an XS or S or 2 or 0 (yes its happened before and I was reeling) but the thrill soon passes when you realise that out of that one store, those sizes don’t exist in other brands. Do you have a problem with vanity sizing? So far, i only have no problem when it comes to jeans since many brands measure it in waist and length. Other than that? Are just miserable. I have problem just like you and some time even a 4 look loose on me. After that i just walk pass some shop even the clothes inside attract me sooo… much, cause i know they wont fit me, ugh! I tell you…I super hate it when they don’t standardize their sizes. So normally, I note down in my hp the brands and the sizes I wear. But so far, the international brands have remained the most consistent one across the board. I’m a size 8 or rather S internationally I think…and sizes don’t affect me. I just need something that fits. I do realise that it’s more difficult when it comes to pants. I fluctuate between size 8 and 10 depending on the cut and brand. I prefer sizes in numbers. So much easier. All the while I thought 8 is a size S but in Forever 21, I wear a size M and I have no idea what size M is in no. Super confusing! And, I think EU size and US sizes should just standardize…I am a size 4-6 (S) in the States but size 8 in Europe countries. Sigh. Nikki: Asians seem to think everyone is super small while western brands seem to be larger. Most confusing! I however have less problems with shoes as I’m quite consistently a size 36! a.min: Ah yes, jeans are probably the most consistent in terms of sizing. Everything else is out the window. S-kay: I usually just try it on in whatever smallest and next size up is available. Numbers don’t bother me but I guess its not true of others. Oh I don’t know. I really don’t mind it, hehe. Here in Oz, I range from Small to Large (L if bought in Chinese clothes shops). But for the rest, I’m an M. In M’sia, I can’t get anything less than a bloody XL. In Singapore, getting anything more than XL is like hunting for treasure. Most of the times, you can only get plus-size clothings in Dorothy Perkins, Marks & Spencer, a couple of brands in Robinsons and risk wearing the same clothings as the other girls on the streets. I had an incident once at my workplace where my colleague and I wore the same blouse.. and the same colour! It’s so embarassing! But (luckily?) another colleague told me that the blouse slooks lightly different on me due to our build (I’m a ‘smaller’ size (UK16) than the other colleague) and I had added on other accessories. I’d be pretty happy (and thus proving that I’m susceptible to vanity sizing! LOL) if I could fit into either M or S sizes. Unfortunately, for Asian brands, I normally end up as L or even XL, due to shoulder/bust/hip cutting problems. I would so love to be in Tine’s shoes right now! I am very small-sized girl and I cannot fit in most Western brands because they are too big for me even for size S or XS. I am okay with Asian brands though, usually I can fit in their S or XS size. I am thrilled when I get a smaller size too, but really t doesn’t really tempt me to get all my clothes from that particular shop only. Designs and comfort are more important! my experience: there’s US sizing, of which there’s womens sizes (even number scale) and junior sizes (odd number scale); UK size which is even number; European size which is even number double digits. Within those sizing systems typically can expect to be the same size, maybe going up or down one size depending on brand or style of clothing. I’m a 12 in US size (US L = size 12-14), 14 in UK size, 42 in European. if i know what sizing system a brand uses then i start from these figures and go from there. Asian brands? no way, i can’t fit into anything by asian brands! and funny enough, neither can my mom even though she is a slender and petite woman, 5 ft 2, US size 4. so it’s not just about being thin, it’s also your bone structure. I don’t think it’s vanity sizing because American women do tend to be larger esp across the shoulders and hips. Their shirts are cut for broader shoulders while Asian brands tend to be more narrow. FYI my mom and i also fit well into VS bras but Asian brands are really uncomfortable for us, the cups are too narrow and close together. i used to wear M and S back in Asia, but since coming to North America, I always have to pick whatever the smallest size is of the brand. Generally i find Banana Republic the most guilty of vanity sizing – most of their size 0’s don’t fit me. I’ve noticed that of all the international brands, Esprit and Benetton are much better for Asians on the petite side. Yeah, being of larger frame, I can’t really buy clothes in Asian shops. The XL usually can’t fit me. But I noticed that in recent years, they are changing the cutting and size. I am able to fit into the largest size usually, L or XL depending on how many sizes they have for each design. But its true about vanity sizing. Recently I bought a stretchy top from a small little no brand shop that says their stock comes from Paris and I am an S. There are only 2 sizes available. S and XS. Goodness. And now the larger cutting clothes are in and I can fit in S, M, L, XL depending on how fitting, short I want the clothes to be. All in 1 shop too. Thats just mind boogling.